> Products>Theology and Doctrine>Mary - Another Redeemer? Dr. James White explains what you should know about the controversial movement to name Mary as Co-Redeemer with Christ. The New “Mary” Question. Millions of petitioners from around the world are imploring Pope John Paul II to recognize the Virgin Mary as “Co-Redeemer” with Christ, elevating the topic of Roman Catholic views of Mary to national headlines and widespread discussion. Mary—Another Redeemer? sidesteps hostile rhetoric and cites directly from Roman Catholic sources to explore this volatile topic. It traces how Mary of the Bible—esteemed mother of the Lord, obedient servant and chosen vessel of God—has become the Immaculately Conceived, Bodily Assumed Queen of Heaven, viewed as Co-Mediator with Christ and now recognized as Co-Redeemer by many in the Roman Catholic Church. 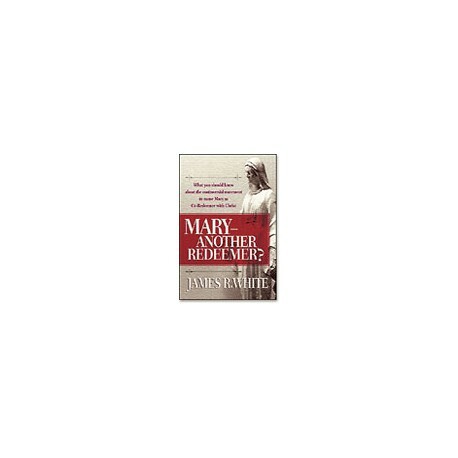 Mary—Another Redeemer? is fresh insight into the woman the Bible calls “blessed among women,” and an invitation to single-minded devotion to God's truth.